The S2Biom project - Delivery of sustainable supply of non-food biomass to support a “resource-efficient” bio-economy in Europe - supports the sustainable delivery of non-food biomass feedstock at local, regional and pan European level through developing strategies, and roadmaps that will be informed by a “computerized and easy to use” toolset (and respective databases) with updated harmonised datasets at local, regional, national and pan European level for EU28, Western Balkans, Moldova, Turkey and Ukraine. Theme 1 will focus on methodological approaches, data collection and estimation of sustainable biomass potentials, resource efficient pathways and optimal logistical supply routes as well as the development of a computerised toolset. The work outputs, apart from the toolset will include fully populated databases at local, regional and pan European levels as well as manuals for their operation, maintenance and updates. Theme 2 will make use of the findings of Theme 1 and develop a Vision, Strategies and a R&D roadmap for the sustainable delivery of non-food biomass feedstock at local, regional and pan European level. Theme 3 will validate the findings from Themes 1 and 2 and ensure the project outreach. This will be performed through selected case studies which will efficiently capture the different scales of applications for biomass supply chains in a sufficient number of regions across Europe. S2Biom is co-funded by the European Union within the 7th Frame Programme. Grant Agreement n°608622. In this S2Biom newsletter issue, we would like to present an overview about the project and give a brief update on our project activities during the first 6 months of the project duration. Specifying data requirements for regional and national data collection as well as identifying, collecting and processing existing data. Identifying gaps in existing data and designing and implementing modelling and post-model analysis procedures and remote sensing based approaches and spatial disaggregation procedures to fill the gaps. Designing and populating a database with latest available and improved data. Developing of an approach for biomass crop selection and estimation of future biomass crop potential. Developing best practice guidelines and a concept for long term utilisation and regular updates of the data. 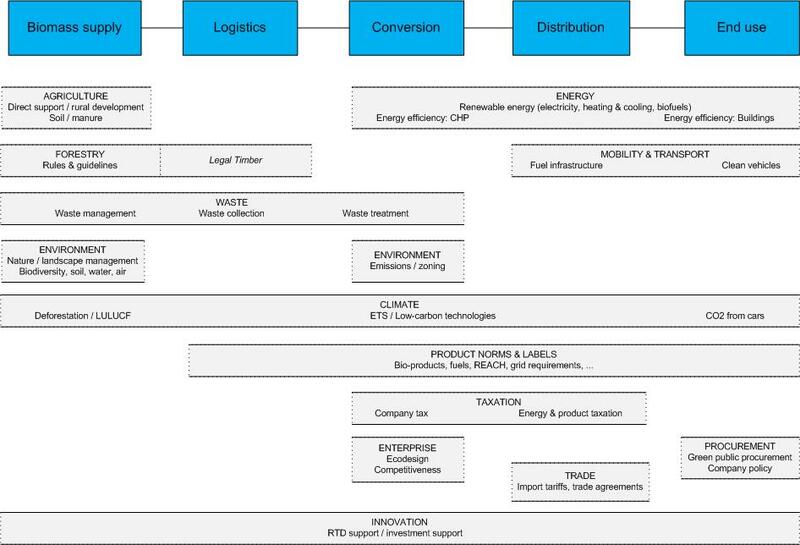 In WP2 existing and future biomass conversion technologies for energy and bio-based products are identified. Biomass conversion technologies form the essential link between the different available lingo-cellulosic biomass sources and the broad range of end uses and markets. Each conversion technology has specific biomass input requirements, while the quality of biomass differs largely between the different biomass types. Obviously some biomass types can be used in many different technology options, while others are hard to process or will need extensive pre-treatment. To identify and extensively characterise existing and future non-food biomass conversion technologies for energy and bio-based products. To develop a standardized methodology according to which the different biomass categories identified and quantified in WP1 need to be characterised. To assess the optimal match of biomass categories of different quality with the existing and future non-food biomass conversion technologies. During the first half year of the S2Biom project the emphasis has been on the identification and characterisation of existing and future non-food biomass conversion technologies for energy and bio-based products. A report has been prepared on “Classification of conversion technologies”. In this report an overview is presented of existing and future thermal, chemical and biological conversion processes for lingo-cellulosic biomass. 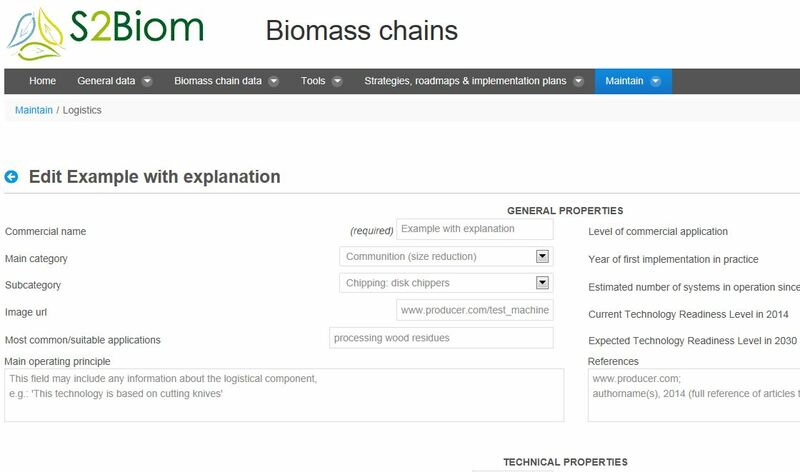 In cooperation with WP4 a database structure has been developed in which the main technical properties and minimum biomass specification for the different conversion processes can be filled in, together with financial and environmental data. To identify and characterise the main logistical components such as storage, pre-treatment and transportation technologies. To identify and assess existing and develop new logistical concepts (e.g. biomass hubs and optimal transportation routes). To translate theoretical logistical concepts to specific cases, and design the most promising logistic supply-chains for cases at local, regional and pan-European level. The emphasis in the first half year of the S2Biom project has been on the task of identifying and characterising the main logistical components. For that purpose a report called “Classification of logistical components” was written. Furthermore together with WP4 a database structure has been developed to store data on the main technical, economic and GHG efficiency characteristics of the logistical components. A screenshot of the first draft can be seen in Figure 2 and 3. The partners will start filling the database with logistical components starting of March. Provide easy access to and a systematic, visually attractive and readily understandable spatially specific overview of data on cost-supply and of biomass and other related technical, environmental and economic parameters of the biomass categories in EU28, Western Balkans, Ukraine, Turkey and Moldova at regional, national and European wide scale. Develop a tool that supports the development of the best practice strategies for sustainable lingo-cellulosic biomass production with woody and grassy crops while maintaining and even improving the overall environmental quality of a region. Provide access to and a systematic overview of the data main technical, economic and GHG emission parameters of current and future pre-treatment and conversion technologies. Provide technical support to end-user for identifying the best match between a given amount of biomass with specific characteristics and the conversion or pre-treatment technology. 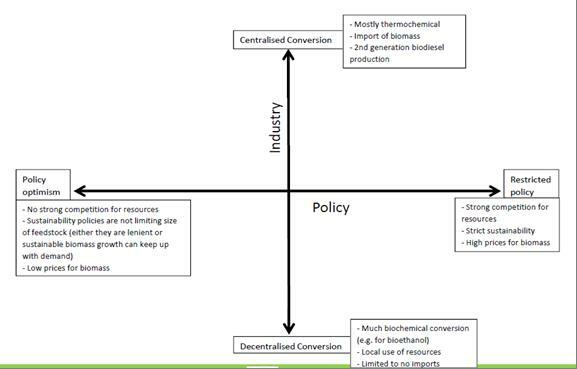 Provide a systematic, geographically specific overview and description of policies implemented towards biofuel production and wider development of a bio-based economy and the interrelations between these policies. Develop an integrated toolset enabling stakeholders to design and evaluate sustainable biomass value chains for their own regional and national territories. Develop a general user interface enabling easy access and use of all the tools, roadmaps and strategies developed in this project and integrated in the central toolset developed in this WP. The toolset is thus in the heart of the project. Since the beginning of the project in September 2013 much progress has been made in designing the database structures that will be feeding the toolset especially in relation to information on cost-supply of biomass (together with WP1), on biomass conversion technologies and on logistical concepts and pre-treatment technologies for biomass. 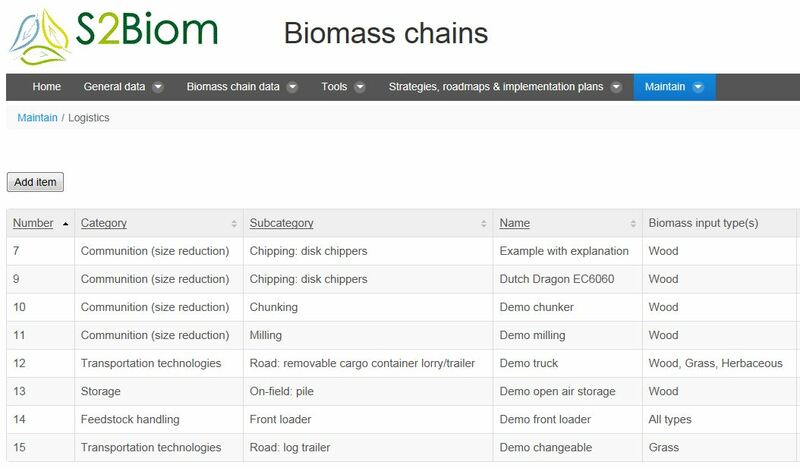 The elaboration of the structure of the database is very sensitive as it is the basis for the elaboration of all components in the tool set that enables a user to make optimal matches between biomass types, logistical and pre-treatment sets and conversion processes. The overall design of the user interface of the interactive tool has also been elaborated (Figure 4). The user interface is the main menu which is presented when the end-users start up the tool. WP5 is focused on the “Value chain sustainability across the bio-based sectors”. The general objective of WP5 is to provide an improved understanding among decision-makers in policy and industry regarding sustainability requirements in the biomass value chains addressed in Theme 1. Up to now, the main effort has been done within task 5.1 “Adaptation of the life cycle-based European Commission Environmental Footprint methods in order to develop a complementary methodology specific to non-food biomass value chains”, leaded by JRC. This task is foreseen to be completed by the end of the year. During this year, relevant progress is expected in the remaining four tasks, aimed at: the identification of sustainability criteria and indicators for non-food biomass value chains, gap analysis of respective legislation, regulation and voluntary schemes at international, European and MS level; the compilation of consistent sustainability C&I for the short- and medium-term bio-economy, and an outlook for long-term developments and the development of guideline for the evaluation of the environmental performance with the toolset developed in WP4 of all lingo-cellulosic feedstocks for the various industrial routes. Different EU-wide and national/regional policies are playing a role in the mobilisation, supply, conversion and end-use of non-food biomass. Various policy departments play a role. Figure 5 shows an overview of EU-level policy departments and their competences relevant for biomass mobilisation and use. Figure 5. Overview of EU-level policy departments and their competences relevant for biomass mobilisation and use. This work package will make a structured overview of economic and regulatory frameworks that relate to the sustainable delivery of non-food biomass at different levels of governance across Europe (i.e. local, regional and pan-European). Relevant policies are collected and parameters to describe these are entered in a database. We will also develop coherent policy guidelines that will allow policy makers to quickly appreciate the support frameworks that exist and the most efficient ways to apply them for the future use of biomass in a sustainable manner. The current stage of the work package is that a template has been produced indicating general info, type of legislation, feedstock relevance, relevance for specific applications and life cycle phase affected. Collection of policies is on-going in 11 European Member States (connected to the IEE project Biomass Policies) – this will be enlarged in the S2Biom project. This activity will define the optimal pathways (by employing the RESolve model) towards a low-carbon bio-based economy that focuses on stimulating the prioritised biomass applications for 2020 and 2030.The work will build mainly (sustainable biomass cost-supply assessment, non-food biomass market demand industrial end use requirements and logistics, hubs and transport routes), and value chain sustainability across the bio-based sector. The most promising (according to their economics and GHG reduction impacts) and the relatively large scale biomass-to-end use chains for the industry (non-energy bio-based sectors) will be defined for the indicated time frames (within WP2). This information will be fed into the existing ECN RESolve-biomass model that includes the energy sector for the EU28 (at Member States level), Ukraine and the rest of the world. 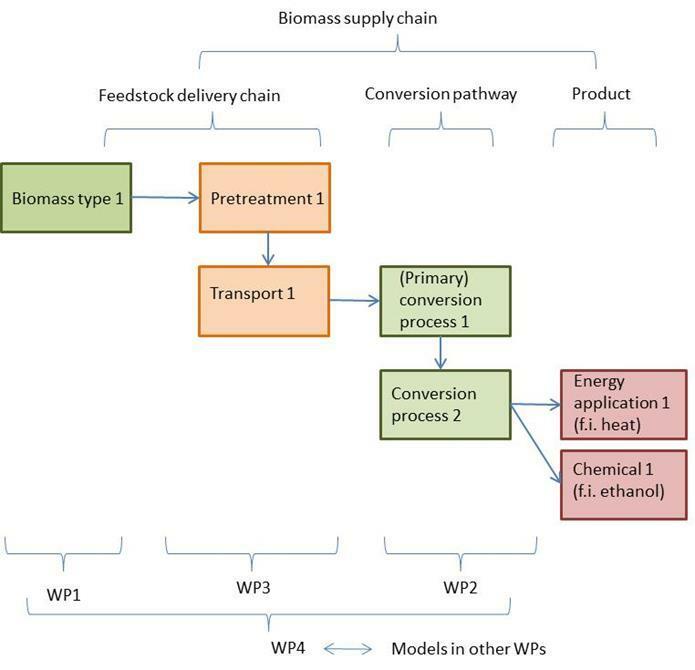 As a next step, the entire production chain of energetic and non-energetic biomass products are optimised in model-based scenario analysis, based on the indicators defined in WP5 (economic and environmental indicators). The modelling results will form the basis for integrated assessment and the roadmap towards a low-carbon, partly bio-based economy that stimulates the prioritised biomass applications. The main aim of this work package is to develop a vision, strategies, implementation plans and an R&D roadmap for the sustainable delivery of non-food biomass feedstock at pan-European level. The strategies and implementation plans will be further adjusted so that they can be used at the regional level. During the first six months the work focused on mapping the current status for sustainable non-food lingo-cellulosic biomass supply in Europe in terms of policies, financing frameworks and existing plants. The main output of this work will be a coherent overview of information, predominantly quantitative in nature, laying out the current state of biomass for bioenergy, biofuels and biomaterials and it will also include a review of the economic and policy barriers to future lingo-cellulosic biomass deployment and identification of ways in which they might be overcome. Concerning European Union Member States, the review draws on information from Theme 1 (WPs 1 & 2) as well as secondary information sources, including EC statistics, national statistics, published reviews and reports, trade association data, etc. The links by the project team with various research projects under FP7, European Bioenergy Networks (EUBIONETIII) and IEA Bioenergy will be an important asset for this task. To assist data gathering for the Western Balkan countries, Moldova, Ukraine and Turkey, a dedicated country template has been developed. The template was prepared in collaboration with WP9 and has been sent to the respective project partners late October. The filled templates have been received and the respective information is currently being integrated to the overall report. The first draft of the report is expected by the end of May. The Consortium being aware of the importance of the contribution that stakeholders could do to the advancement of the Bio-economy in general, and of the non-food lingo-cellulosic biomass value chain in particular, relevant efforts have been made to develop a comprehensive Stakeholders Engagement Plan that would allow establishing an effective channel of communication with all interested parties. To this end, all Project Partners have been mobilised to contribute with their knowledge to map relevant stakeholders and enlarge the existing network of contacts. Through the Stakeholders Engagement Plan, the S2Biom Consortium aims at meeting a comprehensive set of objectives including dissemination and communication. Stakeholders’ feedback will allow better targeting of S2Biom activities: a real-life bottom-up perspective to Strategies, Roadmaps and tools (SRT) will ensure that the actual needs of different categories are weighted. On the other hand, the involvement of stakeholders in validation exercises will allow performing accurate assessment of the applicability of the measures proposed. The network of stakeholders will be constantly enlarged and strengthened during the project’s life and will further facilitate dissemination of project results through capillary outreach at different levels and among diverse categories. The Stakeholders Engagement Plan has been presented to the S2Biom Policy and Industry Advisory Committee during the meeting that was held in Brussels on February 13, and is currently undergoing fine-tuning. On that occasion, Project Partners discussed also the opportunity to partially redesign the activities referring to the mobilisation of working groups, as the envisaged thematic approach might lead to fragmented output.